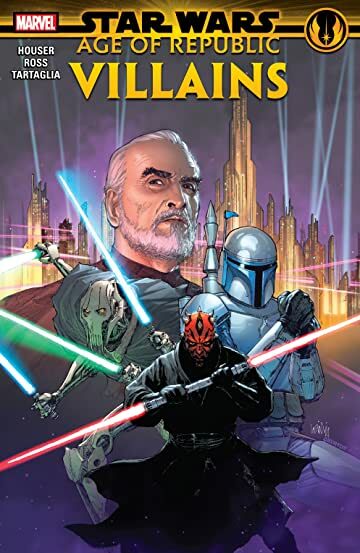 Collects Star Wars: Age Of Republic — Count Dooku, Darth Maul, General Grievous, Jango Fett And Material From Star Wars: Age Of Republic Special. 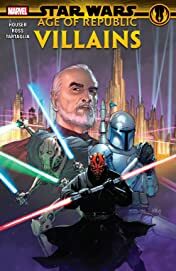 This is the Age of Star Wars — an epic series of adventures that unite your favorite characters from all three trilogies! And we’re bringing on the bad guys — shining a light on the Old Republic’s darkest figures, starting with Darth Maul! A living weapon of rage, Maul lurks in Coruscant’s shadows waiting to strike against the Jedi Order! But the bloodthirsty Sith Lord questions his methodically plotting master’s wishes. Could Maul have walked another path, or was he always fated to follow this dark road? Meanwhile, Count Dooku begins laying the groundwork for the conniving Darth Sidious! The fearsome separatist General Grievous strikes! Jango Fett’s reputation as the most feared bounty hunter in the galaxy precedes him as he joins a crew for what seems like a simple job. And delve deep into the dark side with Asajj Ventress! 2019 Lucasfilm Ltd. & TM. Used under authorization. All rights reserved.